Gurdwara Sahib Shahidan is a wonderful historical shrine located at village Ladhewal in Mahilpur town of Distt Hoshiarpur, Punjab. This shrine is dedicated to Shahizada Ajit Singh, the elder son of Shri Guru Gobind Singh Ji. Sahibzada Ajit Singh, on his way back from Bassi Kalan where he had gone to rescue a young Brahman bride from the clutches of the local Pathan chief, halted here to cremate few of his warriors, who had been wounded in the skirmish at Bassi and had since succumbed to their injuries. In the remembrance of Baba Ajit Singh and the Shahid Singhs, a jorh mela is organized every Tuesday in the month of jeth (May/June) and an amrit sanchar ceremony is held at Gurdwara Sahib. Gurdwara Shahidan (Harian Vailan) sacred place situated on the north side of the Gurdwara. 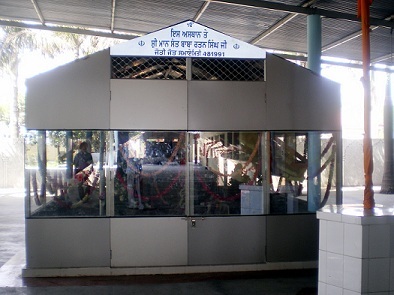 At this place those Sikhs were cremated which got martyrdom during the battle against Zabar Khan. At this sacred place Sahibzada Ajit Singh, the oldest son of Guru Gobind Singh, arrived with 100 Singhs via Mahilpur, Shahidan Ladhewal and Chukhandi Sahib, Bajror in 1703 (1760 Bikrami). Sahibzada Ajit Singh came for a stay at this Gurdwara after securing the release of a Brahmin Paras Ram’s wife from the hands of Zabar Khan. Many Singhs got martyred after fighting with Zabar khan, whose cremation ceremony (antim sanskar) was done at Shahidan Gurdwara. This marble clad thara (platform) is situated on the right side of the entrance of the Gurdwara’s main building, the Darbar Sahib. It has a blue coloured Nishan Sahib. Then they took Zabar Khan to Anandpur Sahib before Bharat Shah got order to dig a hole, put Zabar Khan in it and fire arrows. They did the same. 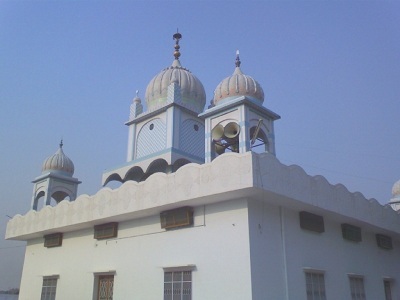 Gurudwara Tahli Sahib, Gondpur is located about 7 km away from Mahilpur, district Hoshiarpur. Gurdwara Tahli Sahib, is dedicated to Guru Hargobind Ji, who came here from Pur Hiran on his way to Kiratpur Sahib and stayed in a grove of tahli trees. A platform was raised on the site amid the grove as a memorial which used to be called Guru Kian Tahlian. The platform was later replaced by a Gurudwara. The present building, constructed in 1930, is a rectangular hall, with a sanctum at the northern end. A square room with a lotus dome above it tops the sanctum. 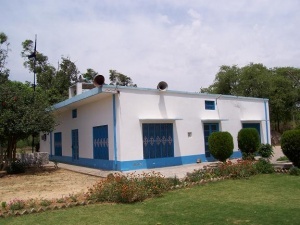 In the adjoining compound is the Guru Ka Langar and rooms for the Granthi Singhs. The Gurdwara is affiliated to the Shiromani Gurdwara Parbandhak Committee and is managed by the local committee. Besides daily services, special assemblies are held on the 1st and 13th day of every Phagun especially because of the belief that it was on the 13th day of the month of Phagun when Guru Hargobind Ji visited the place. 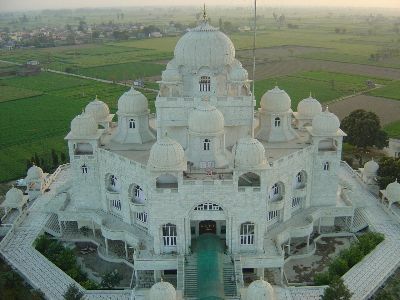 Gurdwara Nanaksar Sahib is situated in village Sarangowal which is about 18 kilometers away from Hoshiarpur city. This gurdwara was founded 25 years ago by Jathedar Baba Harbhajan Singh of Misal Shaheedan Tarna Dal, Harian Belan. 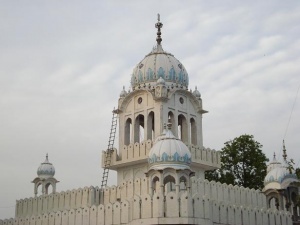 The Gurdwara Sahib is related to Sri Guru Nanak Dev Ji, it is believed that he came here during his missionaries journeys and had a discourse with Sidhas. There is a memorial of Sidhas preserved here. The Gurdwara is under control Misal Shaheedan Tarna Dal, Harian Belan. 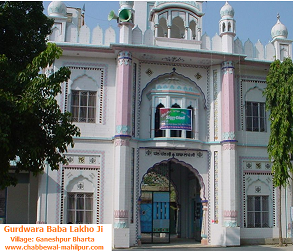 Gurdwara Baba Lakho is situated in village Bharta-Ganeshpur, near Mahilpur in district Hoshiarpur of Punjab. 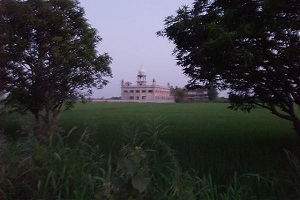 Gurdwara Tharha Sahibis is the place Guru Hargobind ji met Baba Lakho ji. Guru Hargobind ji came here on the request of Bhai Lakho Ji who was a disciple of Guru Sahib. A few kilometers away in Village Panch Nangal there was a man named Kalu who was constructing a replica of Sri Harmandir Sahib and its Sarovar. Kalu was attempting to get the local people to believe that visiting his replica would gain the same benefits as they would get by visiting the Sri Harmandar Sahib at Amritsar. While in Bharta-Ganeshpur, Guru Hargobind ji sent Kalu a message to come and meet with him, but he refused to come. After that Singhs tied Kalu up and brought him before Guru Sahib. Bhai Lakho ji asked Guru Hargobind ji to release him, which the Guru did. But Kalu didn’t agreed and kept on building his replica. Guru Hargobind ji said, that Kalu’s place will not gain the status of Sri Harmandar Sahib. The replica in village Panch Nangal still exists there but nobody visits there. 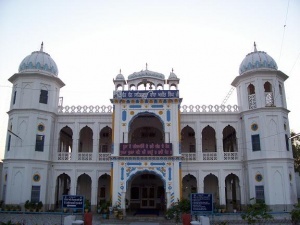 Gurdwara Hari Sar, Mananhana, Hoshiarpur has been built in the memory of 1008 Sant Baba Hari Singh Ji Naikiwale. A four-day double-title Bharat Kesari Wrestling Tournament, held every year in memory of Sant Baba Hari Singh Ji Naikiwale at Gurdwara Sahib. People from far off places come to see the wrestling tournament and pay obeisance at the Gurdwara. 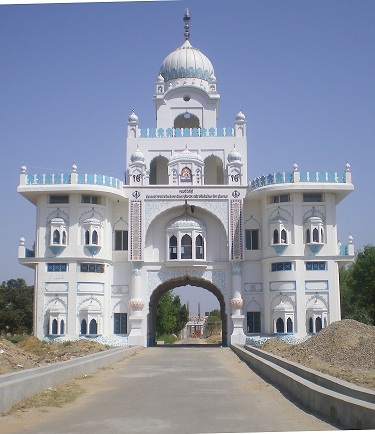 Gurdwara Jand Sahib is a historical shrine situated at village Laheli Kalan, district Hoshiarpur. This place was visited by Guru Har Rai Ji. This shrine was visited by Guru Har Rai sahib, with 2200 Horsemen in 1651 and samat 1708 on Diwali while he was moving towards Harmandir Sahib. He stayed here for three days. The Guru’s horse was tied to the Jand tree (Prosopis Spicegera) is situated over there in old condition. Dara Shikoh was near death having been feed some hair clipped from a Lion , which had been added to some of his food on the orders of his brother Aurangzeb. Guru har Rai ji sent some hard to find ayurvedic medicine to help in his cure, which included a Yang of 5 Tola and Laung of 3 Masha (Ath Ratti Bhar Tol). So from this history, it is also said that Guru Har Rai jee was a Good Doctor too. Dara Shikoh in return gifted a Silver Kaathi of horse with dushaley and horse too. 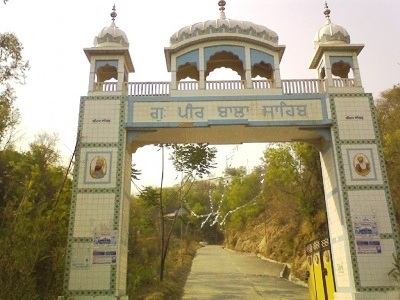 The Gurdwara is situated 3 kilometers internal to the main highway i.e Chandigarh-Hoshiarpur highway in village Lahili Kalan near chabbewal. 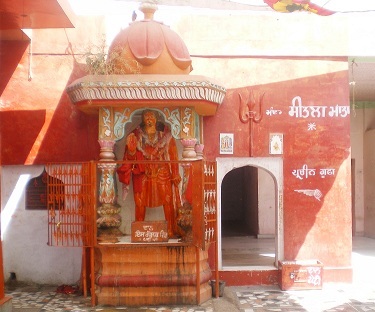 An imposing temple known as “Bhameshwari Mandir” is located in the heart of village Bham, an old village with modern outlook situated at a distance of about 13 km from Chabbewal. 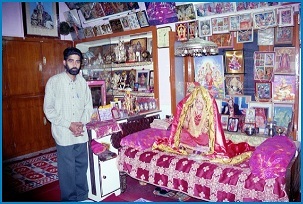 This Mandir has been built by a living Devi (Goddess) who resides there. The Devi is held in high esteem by the area people. A fair (Bhandara) also held here annually during July-August (Sawan 15-18) that lasts for four days and attracts a large number of people from far and near to visit the place. Bham is said to be the place where the Pandavas had passed their exile, a fact commemorated by a temple (Shivala) known as “Shivan Da Mandir”. The temple is unique in construction and one has to step down stairs to pay homage to the deity. A fair is held here annually on Shivaratri Day. Bham is easily accessible from Chabbewal, Mahilpur and Phagwara by bus. Daily service of about 20-25 bus routes make it convenient to connect to nearby cities.